How do we know if residents support organ, eye and tissue donation? We measure the public’s support of donation with the donor designation rate. Although small in population, Wyoming stands tall when it comes to saving lives through organ, eye and tissue donation. The donor designation rate (DDR) is the rate at which individuals join or remain in the state donor registry as a percentage of all driver’s licenses and ID cards issued within a specific period of time. Donate Life America reflects the national DDR average is 48% of Americans nationwide who sign up to be organ, eye and tissue donors when obtaining or renewing their driver license or state ID. In Wyoming, 91% of residents who participated in our public perception survey said they support organ donation. Often, they do not sign-up because they want to learn more or believe untruths about donation. Through outreach, public education and working with community partners, we continue to share the facts about donation and dispel the myths. Pair this outreach with Wyomingites’ pride in taking care of their own and it’s a successful combination for lifesaving growth! Over the last three years, we have seen an increasing support of organ eye and tissue donation. In December of 2018, Wyoming hit a record-setting monthly donor designation rate of 63%! Growth was evident throughout the year and Wyoming finished 2018 with a 60% DDR! This DDR is well above the national average and places Wyoming in the top ten of all states for high donor designation rates. 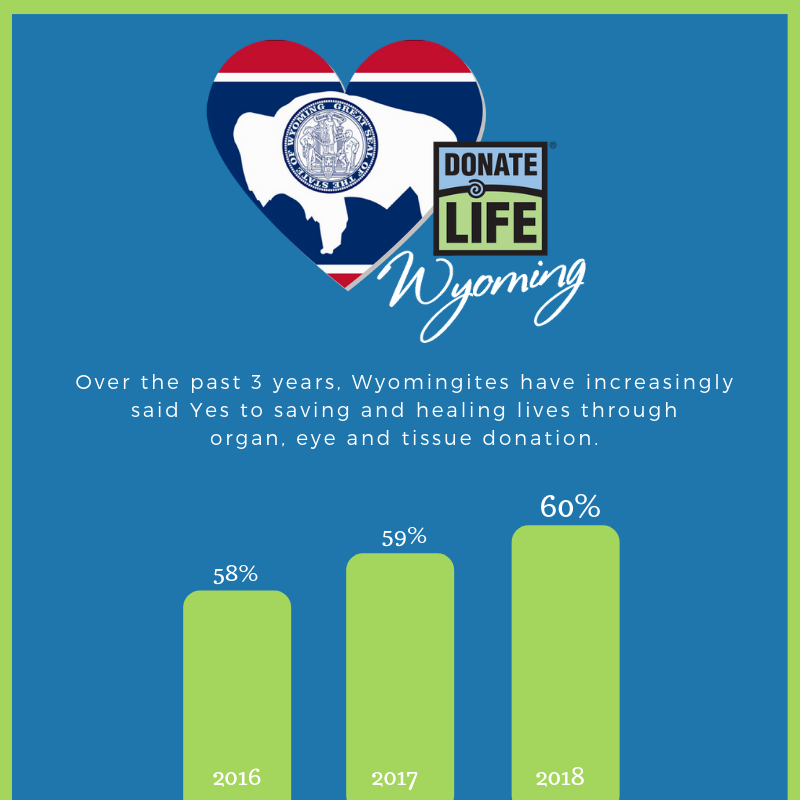 As we set our sights on 2019, we will continue to strive to save and heal lives through organ and tissue donation and transplantation in Wyoming. With nearly 150 Wyomingites awaiting a lifesaving organ transplant and thousands more in need of healing cornea and tissue transplants, the increasing DDR gives hope to all. Remember to check Yes when you obtain and renew your driver license or state ID. Sign up anytime online at DonateLifeWyoming.